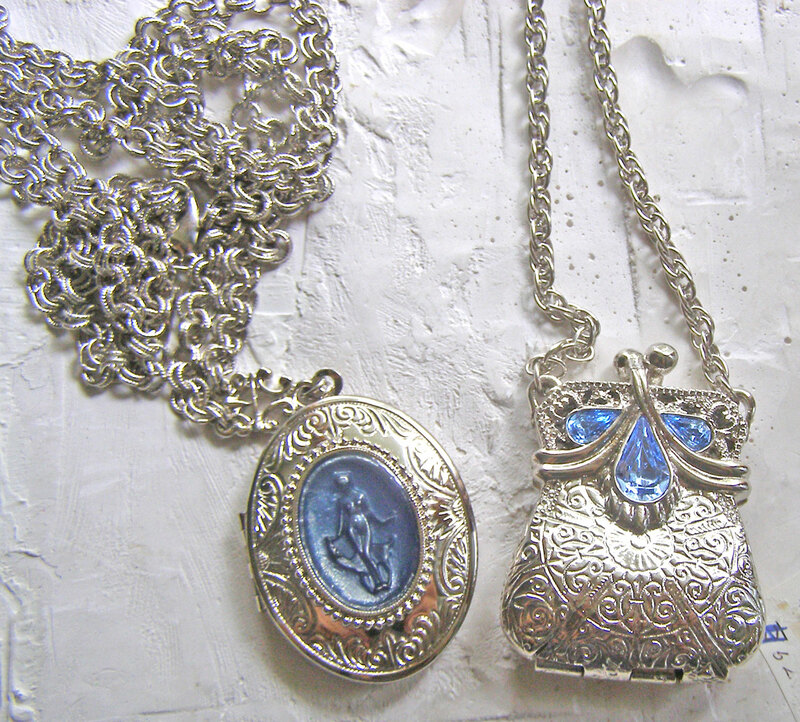 I have always loved the Art Nouveau era from jewelry to architecture. 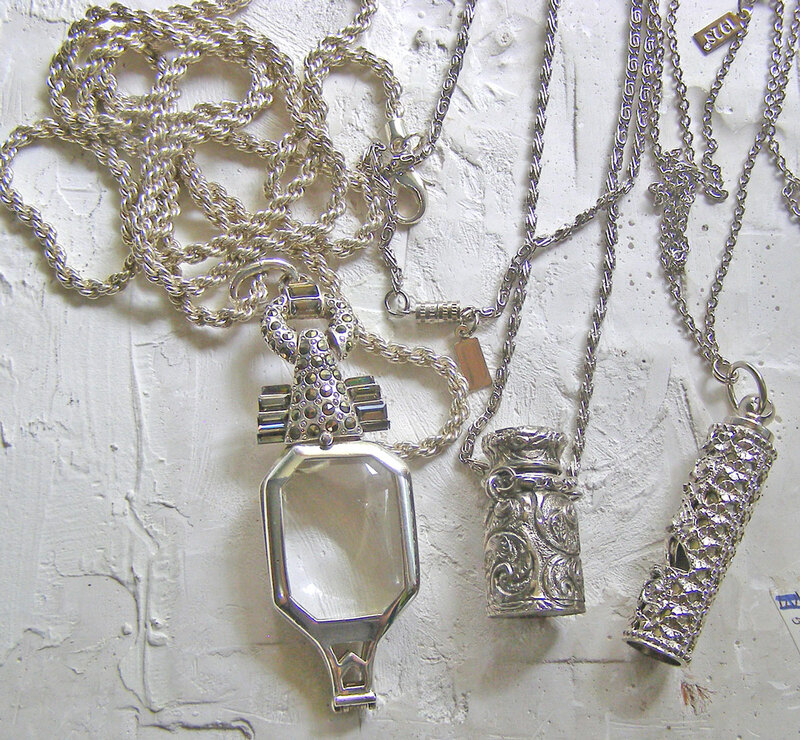 As you can see from the above examples it has a great influence on my jewelry designs. There is something about the free flowing forms and nature that I find so appealing. I am fortunate that I have had the opportunity to travel to Europe and see the beautiful architecture first hand from Germany to Prague in the Czech Republic. The above is an example off of a building in Coburg, Germany. I have many more examples of beautiful architecture to share soon! The two bracelets below are how I like to make the Art Nouveau a bit more edgy. If you would like to be added to my VIP insiders mailing list for sales and special offers: vip insiders! Do you have a favorite piece of Art Nouveau architecture? In addition to making jewelry I love to garden. As I work in the garden I love listening to the buzzing of all the various types of bees busy at work. The faint buzzing of the honey bees to the louder bzzzzzzz of the bumble bees. When I was a child my great grandfather had a wonderful garden of flowers and fruit trees. He also raised honey bees. One of many fond memories is of him collecting the honey from the hives, or of him making us a thick slab of bread with butter and honey. Such lovely, happy and simple times. I created this line of honey bee jewelry with him in mind. Little petite bees in various finishes and your choice of bead color. Just one of many flowers from my garden. Now back to my garden! This lovely vintage bohemian garnet brooch was MIA. Couldn’t find it. I had been searching for it everywhere and was beginning to think that I had put it in lot of newer costume jewelry to go to auction. This made me nervous, angry with myself and of course a bit sad. Lots of forgotten bracelets and the brooch! How that brooch got in there is a mystery. 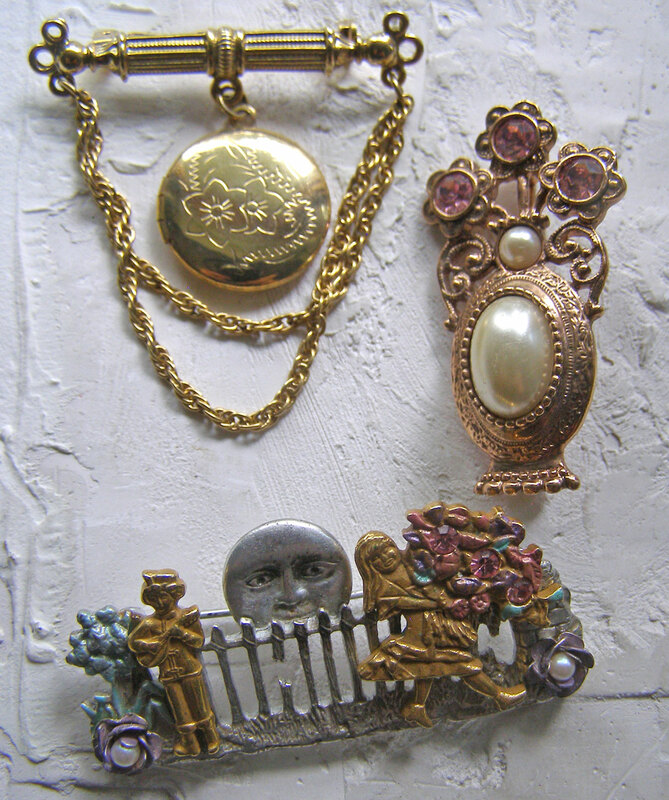 There is an obvious theme of bangle bracelets and then this lonely lovely brooch. Many of the bracelets I have had for years and used to wear frequently. Perhaps I stopped wearing them because the box they were was lonely and forgotten. This still doesn’t solve the mystery of the single brooch but that is ok with me! So I guess cleaning and reorganizing does pay off. One of those tasks that I least enjoy but maybe now I will look at it as an adventure. I may just find some forgotten treasures like the ones below. I love the holiday season. The anticipation of being with family and friends, the music, the cool weather and of course the decorations. I grew up with old Victorian and early European Christmas ornaments and decorations. When I saw this lovely raku Santa pendant made by Harry Wood I just had to have it. (and not just this one) I made it into a necklace along with some of his raku beads. I should have kept it but it is being enjoyed my someone else. 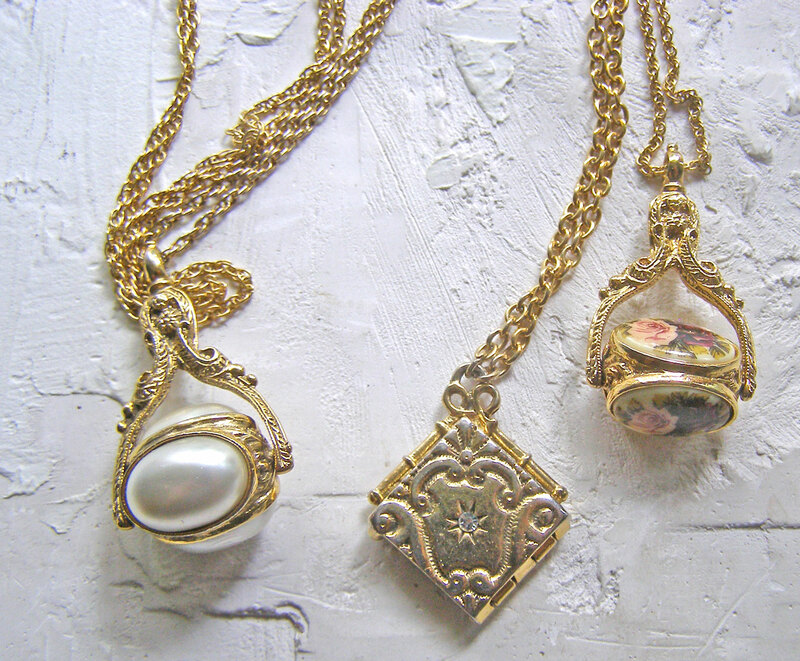 There is something about the nostalgic feel of his pieces that draws me to them and to create some fun holiday jewelry. Though some lovers of Christmas keep things up all year! 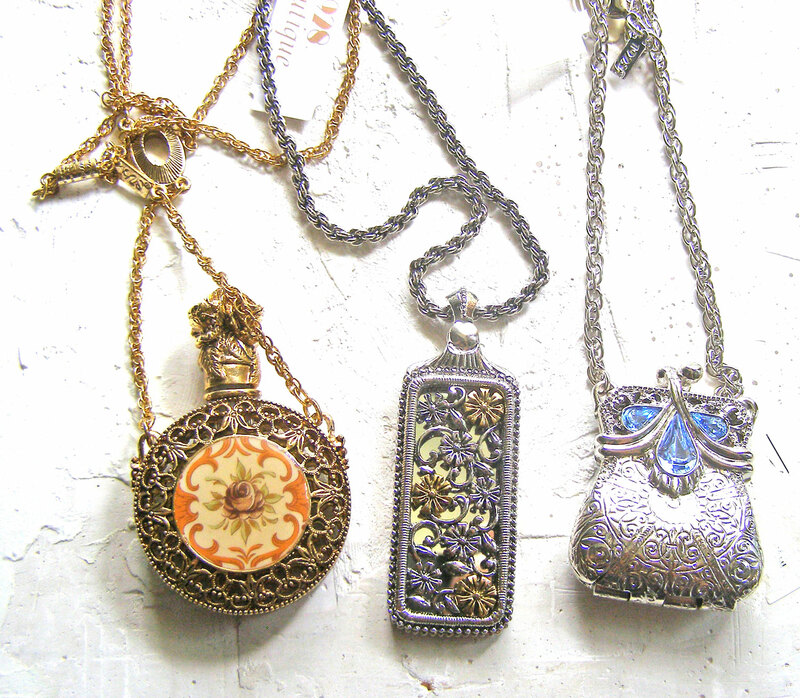 Here are three more necklaces that I sold using Harry Wood’s lovely pieces. What a lovely way to get into the holiday spirit. I have two more pieces available in my etsy shop at the moment. The first I just put on a simple chain and can be found here. The second is a sweet pudgy faced fella with some vintage glass sugar beads and orange beads. He can be found here. There is one more available but I can’t seem to find a photo of him so just follow this link and you will be surprised! Finally if you want to see more of Harry Wood’s awesome creations here is a link to his etsy shop. These would all make great gifts for that lover of Christmas! Now off to start decoration for the holidays. or is it too soon??? 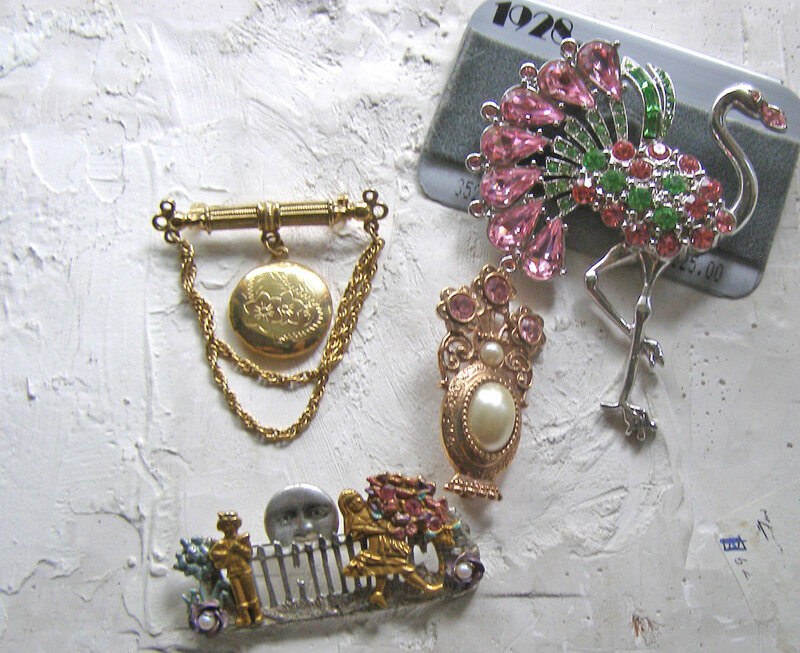 I don’t usually wear brooches so I do not have many in my collection. This is one that I found quite interesting. The pink and green combination reminds me of the old Miami Florida. Plus, who doesn’t love a flamingo!? Probably will just keep this on the card….or may wear it as a pendant. 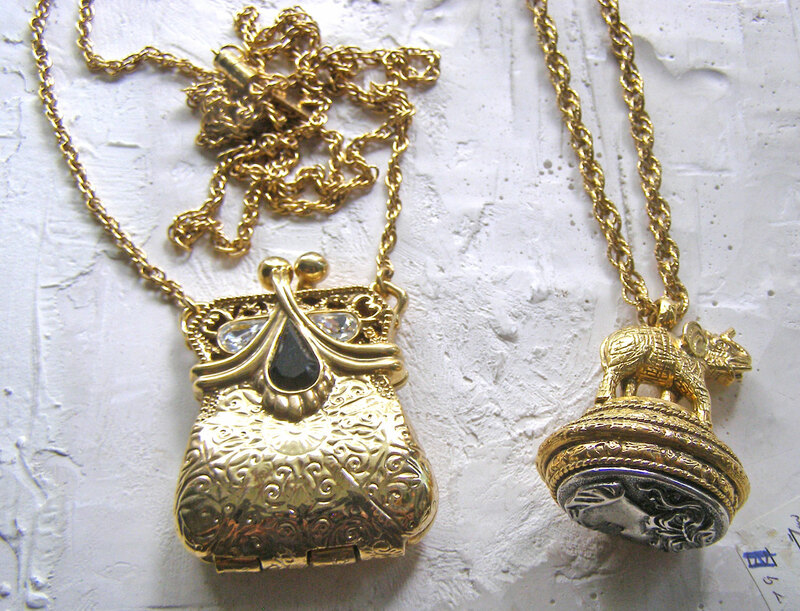 This locket brooch was in a large lot of jewelry that I purchased, again not really something that I would normally wear but love the nod to old Victorian lockets. What a whimsical piece for sure. Love how the bouquet the girl is carrying is almost as big as she. The pickets fence and moon add to the whimsy. I may try to wear this as a pendant, will have to see how it works out. Just kinda fell in love with this one for nostalgic reasons only. Again love bouquets in vases. This one with a hint of whimsy as well. This I will absolutely wear as a pendant. Fantastic detail down to the bohemian dangle earrings! Is it really an obsession? fun? just collecting? fashion?hoarding?………..all of the above. 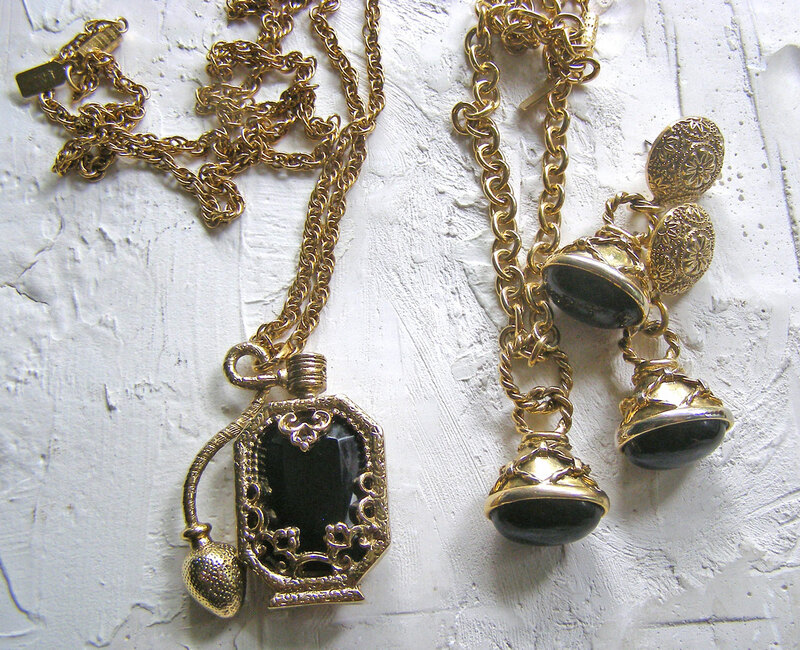 I am in love with 1928 jewelry, especially the vintage/older pieces. I have recently added a few new pieces to my collection as well. 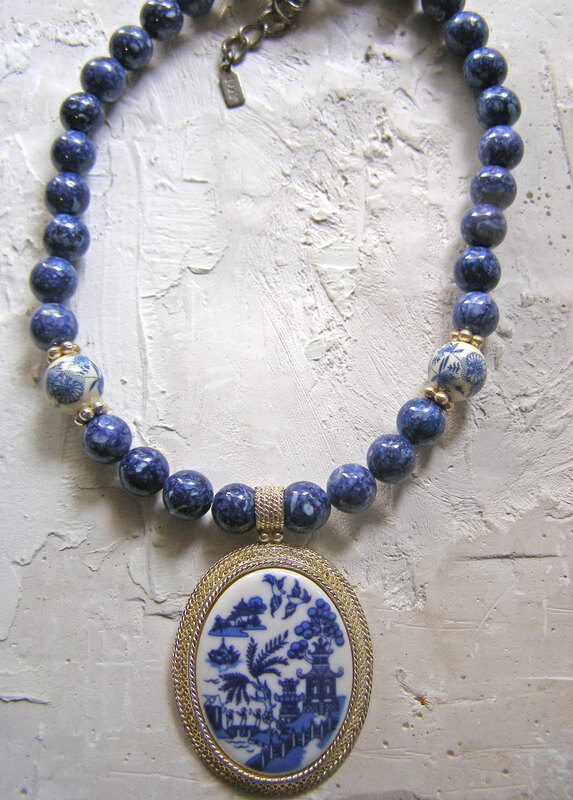 It is timeless jewelry, that is beautifully designed and made here in the USA! Someone should write a book about the company! I will start by sharing some photos and then hope to get into more detail in a later post. Maybe show how I wear the jewelry. OK. I admit it I have a problem! 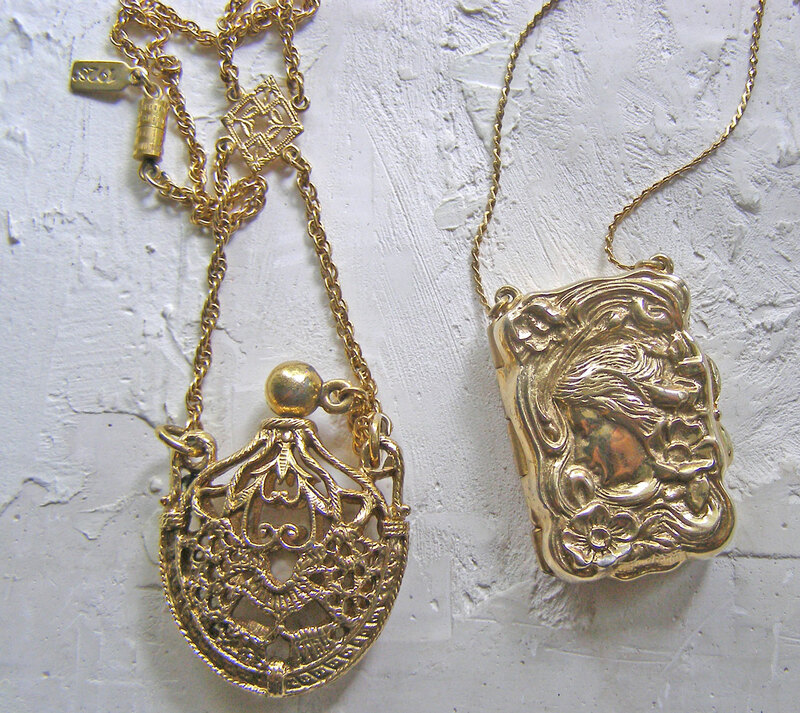 I am obsessed with vintage brass stampings and findings. The above photo shows maybe 1/4 of what I have. I use these to make jewelry if I have multiples of the same piece. I keep one of each and if I only have one then that gets kept as well. 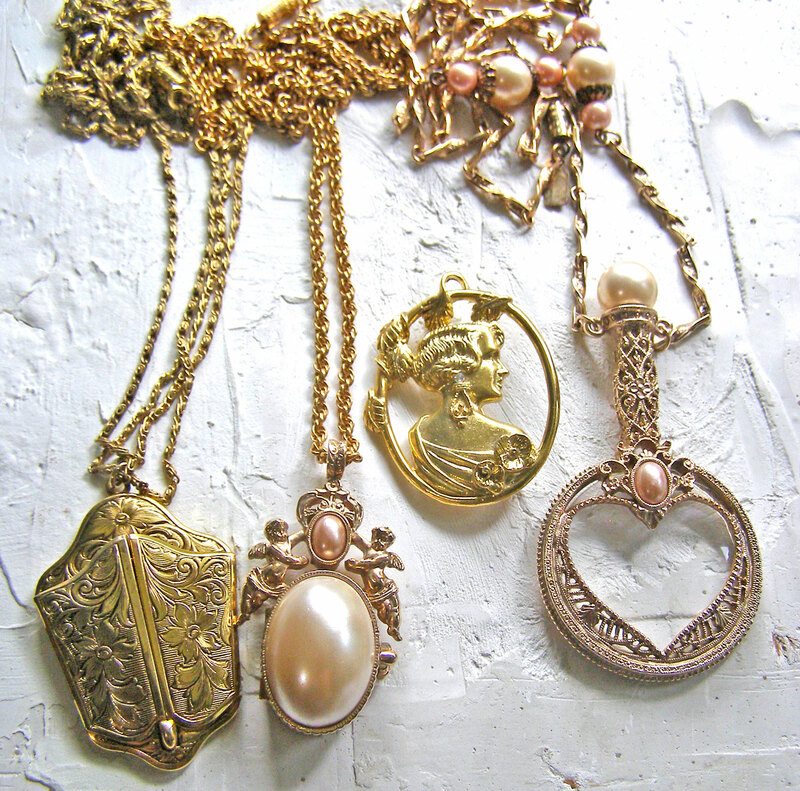 It started with my love of anything vintage and art nouveau and then just ballooned into a collection. I love the detail, designs, smell, touch and design of vintage brass. Things just aren’t made like this anymore. Yes new brass stampings are being made even from old dies but the detail gets lost. The actual process of how these were made is quite intriguing. Now deciding on how to display these without ruining the pieces. Any suggestions?